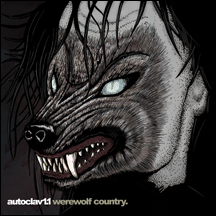 Autoclav1.1 returns with a new, darker, offering in Werewolf Country. Breaking away from, his signature format, Tony Young plunges Autoclav1.1 into the dark side and puts a heavy emphasis on developing his melodic soundscapes. From the string orchestrations and synths of Amitriptyline Nun Chuff and Digital Download Devaluation to the haunting and mysterious title track and Constructive Dismissal, Werewolf Country explores new territories and sets new boundaries for upcoming releases.